CULLMAN – There were plenty of prizes to hand out at Smith Lake Park Saturday afternoon. In all, 179 boats hit the water bright and early to compete in the fifth annual Smith Lake Park Bass Fest. 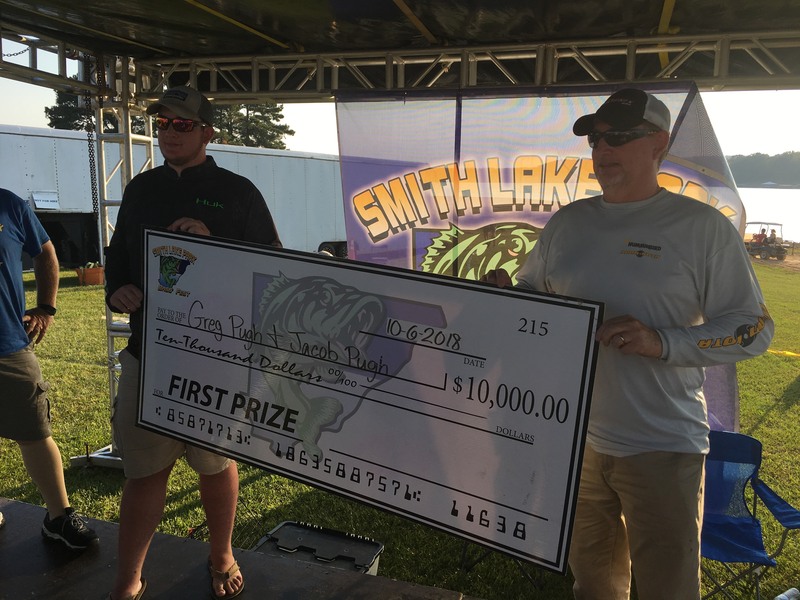 The top 40 finishers all took home cash prizes and the top boat took home the grand prize of $10,000. This year’s first-place finishers, nabbing the grand prize, were Greg and Jacob Pugh, with a total weight of 15.50 pounds. Coming in just behind them in second place and reeling in the biggest fish of the day at 5.69 pounds were Kyle and Luke Glasgow. The Glasgows took home a $500 prize both for their big fish and finishing as the top parent-child team. The University of Montevallo’s Cameron Glasscock and Garrett Whitney finished as the top college team in the field, weighing in at 9.43 pounds, while Sawyer Daniel and Cody Cox of Fairview took home the high school crown with a weight of 5.49 pounds. Previous articleLast evening to enjoy Oktoberfest!